The Indonesian island of Bali is a destination that could be described as a paradise on earth and the perfect place to escape and indulge the senses. On this island you will find everything from jungles to volcanoes, mountain ranges and coral reefs with an abundance of marine wildlife. So why wouldn’t you want to add this to your must-see destinations for a honeymoon or a place to truly unwind? Alongside the natural charms Bali possesses, here’s what you can expect from a luxury wellness holiday in Bali. No luxury wellness holiday in Bali would be complete without a range of decadent spa treatments to rejuvenate the body. Part of this includes experiences for couples who will get the opportunity to tap into their Anahata chakra – the chakra of love – and the Swadhisthana chakra which is said to govern desire and passion within your body. Harnessing these ancient powers of spiritualism and sensory magic is aimed at awakening the fires in your soul and to connect with your partner on an entirely new level. This includes couples massage and tantric meditation. Alongside this you will find a range of other activities to indulge yourself in including Yoga classes, traditional massage and picturesque village walks. Eating healthily is an important of the luxury wellness experience in Bali and with the help of a Michelin-starred chef compiling a heady mix of carefully-crafted aphrodisiac tasting menus each evening, your taste buds will be in for a treat. Mornings start with a specially prepared breakfast followed by a healthy lunch and following the 7 course evening meal you can sit back and unwind with some gorgeous cocktails. 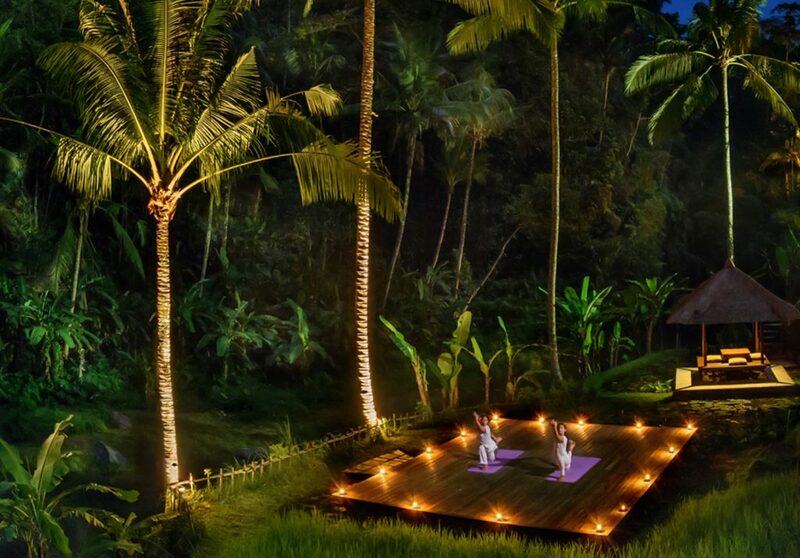 One of the special elements of this Bali wellness experience is Full Moon Yoga. The full moon is of special importance in the ancient customs of Bali and the day of a full moon is named Purnama by Balinese Hindus. Traditionally each full moon is a time to honour ancestral gods and express gratitude with various offerings and ceremonies occurring across the island of Bali. It is also a time to restore balance between god man and nature and an opportunity to oppose negative forces. The full moon yoga experience on this holiday will provide you with an opportunity to participate in this cultural ceremony and embrace the power and energy of this important day in the Balinese calendar. VIP transfers to and from Bali are a feature of this luxury wellness holiday. You will be treated to a meet and greet service both on arrival and on your return journey from the airport and transported in a luxury private vehicle.